When someone gets in a car, they are expected to wear a seat belt. This is instilled upon us from a young age, and, in case we forget, the car will sound annoying alarms and flash lights to remind us to fasten our seat belts. This is not only good advice, but it is also the law. However, this was not always the case. Seat belts were first used in airplanes for pilots and were unheard of in cars. This was also at a time when dashboards and steering wheels were made of hard metals and woods instead of padded materials like they are made today for safety. 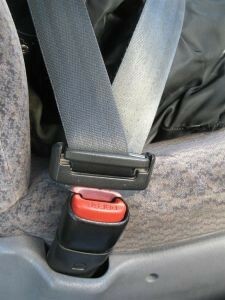 While it has taken many years to ingrain the need to wear a seat belt, it seems that most people are willing comply. According to a recent news release from the National Highway Traffic Safety Administration (NHTSA), we are now at 90 percent compliance in the United States, which is the highest it has ever been. NHTSA first began studying seat belt compliance in the U.S. in the early 1990s and have taken many surveys over the past two decades to see who is reporting to regularly use their seat belts. This is how they can determine we are at such a high level of compliance these days. NHTSA stresses the importance of every person in a vehicle wearing a seat belt at all times, and this includes adult passengers in the rear of the car. The reason for this is simple: wearing a seat belt seriously reduces the chances of a fatality in a serious car accident. Unfortunately, compliance is not at 100 percent. This means that some people will be in serious car accidents when they are not wearing their seat belts. In some cases, it will be the at-fault driver who was not wearing his or her seat belt. However, in other cases, it will be the victim who was not wearing his or her seat belt. In the case of young children, we are talking about an approved child safety seat that is properly placed in the car. While many new parents may not know how to do this, there are various public service agencies that will actually install the child safety seat in your car and teach you how to do it yourself. Despite this knowledge, there will be victims in car accidents who were not wearing a seat belt. If this situation applies to you, you should discuss it with your experienced Boston car accident lawyer during your consultation. This could be relevant if you were injured in a car accident and the other side can show that you would have been injured less, or not injured at all had you been wearing a seat belt. This does not mean you do not have a case, since we are not in one of the few jurisdictions that follow a pure contributory negligence doctrine, but it is possible that your ultimate recovery may be affected. The reason for this is because the at-fault driver is still negligent, but you may be deemed partially responsible for your own injuries by not wearing a seat belt.